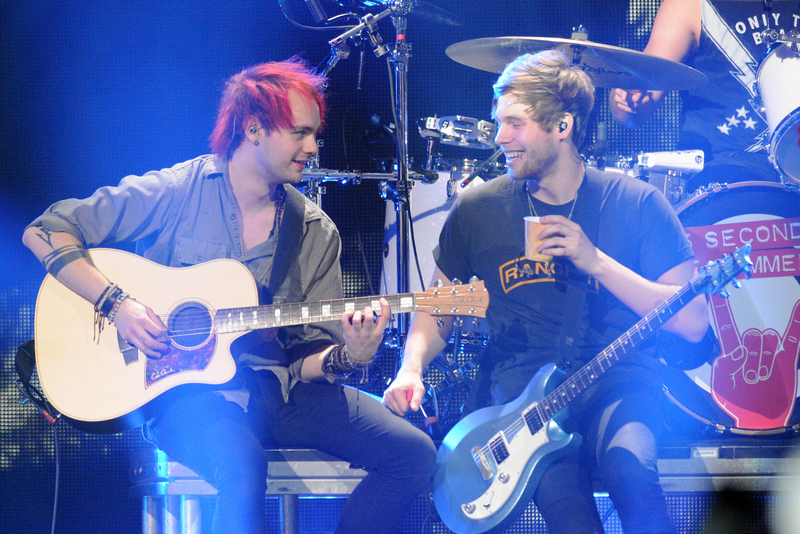 As 5 Seconds of Summer gear up for their worldwide Sounds Live Feels Live tour (come at me, boys), the #Muke half of the group took it upon themselves to make one fan's day in a touching gesture quickly gaining traction among the 5SOS fandom. According to SugarScape, over the weekend, Luke Hemmings and Michael Clifford FaceTimed a sick fan who was unable to meet the guys in person. Though the band is clearly appreciative of their fans, the FaceTime session is a welcome personal touch, a gesture that not only meant a lot to the fan herself, but to the entire fandom as a whole. It's a meaningful step beyond the norm and something that I would love to see the band continue to do in the future. Just watching the seconds-long video is enough for viewers to see how much Hemmings and Clifford make the fan's day just by video chatting with her. It's a heartwarming reminder that to the fans, their idols are everything, and this kind of thing can mean so, so much. And when it's your Make-A-Wish to meet the guys, sometimes, FaceTiming is a close second. It's all about that personal connection. "I don't really feel good today," the fan told the guys over video chat. "Aw, I'm sorry," Michael replied, pouting his lips and causing her to giggle. "You know what helps? Um... um... actually I don't know what helps." This caused the fan and the guitarist to dissolve into laughter, proving that what it is that actually helps is FaceTiming your favorite band. Laughter is the best medicine — but when it's laughter with your idols, it's even better. Good call, 5SOS. Literally.